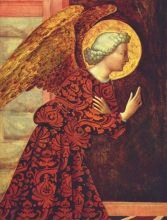 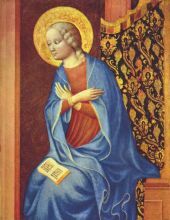 Masolino da Panicale (also known as Tommaso di Cristoforo Fini) (Panicale, Umbria c. 1383 – 1447) was an Italian painter. 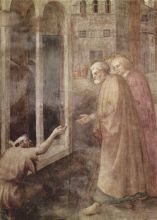 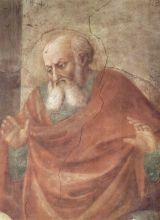 His best known works are probably his collaborations with Masaccio: Madonna with Child and St. Anne (1424) and the frescoes in the Brancacci Chapel (1424-1428). 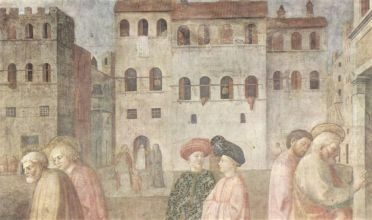 Giorgio Vasari includes a biography of Masolino in his Lives. 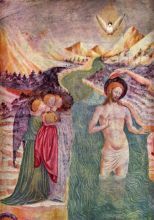 The principal monograph is by Toesca, Masolino da Panicale (Bergamo, 1908); also, A. H. Layard, The Brancacci Chapel and Masolino, Masaccio, and Filippino Lippi published by the Arundel Society (London, 1868); Schmarsow, Massacio Studien (Cassel, 1895-1900); Bernard Berenson, "Quelques peinures méconnues de Masolino da Panicale," in Gazette des Beaux-Arts, ser. 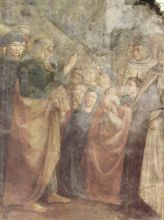 3, volume xxvii (Paris, 1902); Berenson in Study and Criticism of Italian Art, volume ii (London, 1902); Crowe and Cavalcaselle, History of Painting in Italy, edited by Douglas and Strong (New York, 1903); for data on the life of Masolino: Milanesi, Storia dell' arte toscana (Florence, 1873).